The Heather Heyer Foundation will provide scholarships to fight racism. 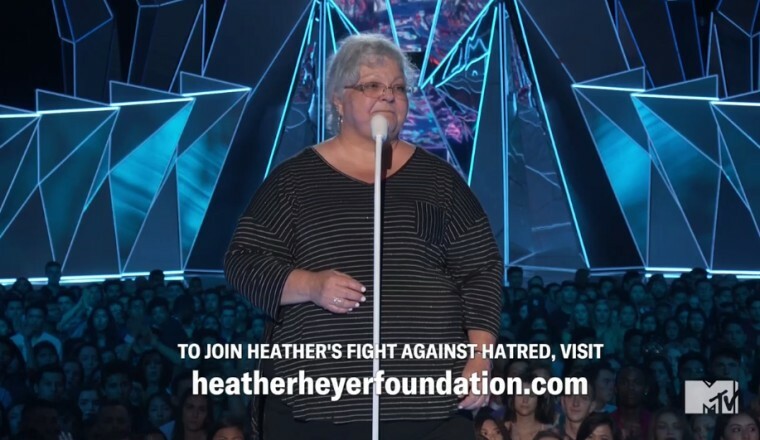 Susan Bro, the mother of slain Charlottesville protester Heather Heyer, appeared on the 2017 VMAs to pay tribute to her daughter's memory and to announce the start of a foundation in her honor. The Heather Heyer Foundation will use donated funds to provide scholarships for students who pursue careers in social justice, law, education and related topics in order to fight racism. "Only 15 days ago my daughter was killed protesting racism," said Susan Bro, "I miss her but I know she's here tonight." She also announced that all six artists nominated for "Best Fight Against The System Video" won the award, in honor of the many platforms and movements working towards social justice.